I've been drawing A* with a pencil for about a year and a half, and for all that time I've been using a Staedtler Mars plastic eraser, as it was the best eraser I found at the local art supply superstore; it was miles better than the old rubber erasers I was used to, so I was pretty pleased with it. But recently I switched from mechanical to wooden pencils, and with all the extra graphite they sling around, things have been getting a bit messy--the Staedtler wasn't quite able to keep up. So I got to wondering if maybe there was something better out there; since the best pencils I'd been able to find were from Japan, I figured I'd see how they are at erasers, and ordered up eleven of the most useful looking items from the block eraser section of import site jetpens.com. Being the finicky person I am, I could not rest until they'd arrived and I'd determined once and for all which was the best. The old Eberhard Faber Pink Pearl at the bottom there is just for scale; I did try the Staedtler, to the right of it, against the Japanese erasers, but it didn't last long. Keep in mind that I only tested these erasers with the pencil and paper I use for A*: Tombow Mono Professional Drawing Pencils, grade H, and Canson Artist Series Illustration Paper, a stiff, single-ply 150 lb paper with a little bit of tooth to it and a slight anti-bleed treatment; results with other materials could vary! (For results on Bristol with softer 4B lead, which did indeed yield different results, see round 2.) 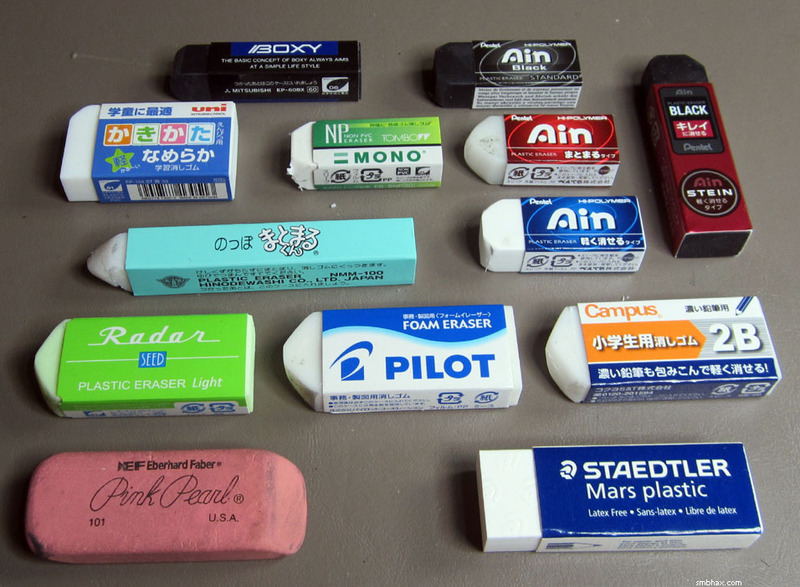 Happily, all the Japanese erasers are under two dollars a pop, so why not get yourself a few samples and give them a try yourself? Well, let's get to it, shall we? Only one of these erasers can survive! It's battles of elimination, then, and we'll rub out the worst until only the best is left. With one exception: one very popular eraser was out of stock momentarily, so it got to skip the first batteries of tests--but this darling of the people will arrive just in time to face our surviving gladiator in a winner-take-all deathmatch! 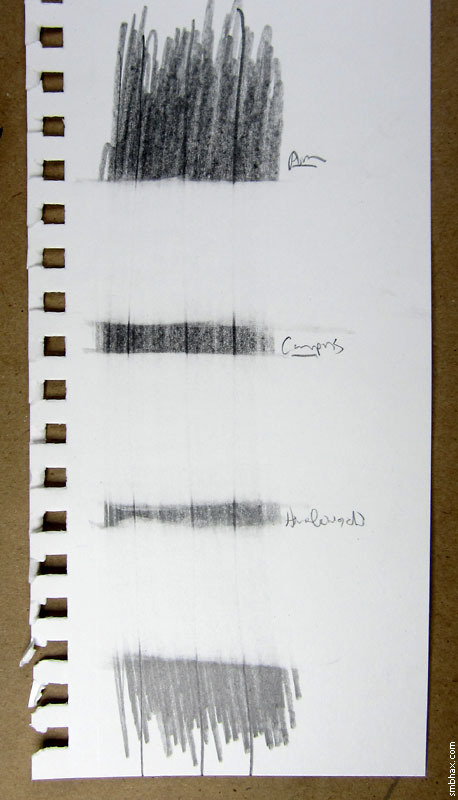 I don't have a photo of the first series of tests I did with all the erasers (except the Pink Pearl, which I allowed to retire with dignity), because it was a fairly casual test over three modest stripes of graphite that quickly proved insufficiently demanding to distinguish the fine differences between most of the Japanese erasers; it was, however, obvious from the first stroke with them that the Staedtler was outclassed: its stiffer material couldn't pick up the graphite from the paper as efficiently as the softer Japanese blocks, and it shredded more easily into lots of little fragments that have to be brushed off the page, inevitably smearing the drawing beneath them. The Staedtler (a "vinyl" and "plastic" eraser, which I can only assume means PVC) was out. This didn't seem to be erasing as easily as the others, and felt awful, crumbling even faster than the Staedtler into little shavings that got everywhere. A far cry from the fabled Mono eraser of yore; Tombow seems to have a guilty conscience about the supposedly unhealthy chemical composition of their beloved discontinued original eraser, but they're overcompensating here and have made a really sub-par follow-up. A PVC eraser, as were all the Pentel erasers I tested--the Japanese erasers neatly identify their composition with a uniform "PVC" printed on their sleeves--the Black Ain just wasn't erasing as well as the three other Ains I tested, so I saw no reason to continue with it. So much for those. Now it was going to get tougher: I had to find a way to strain these remaining erasers. 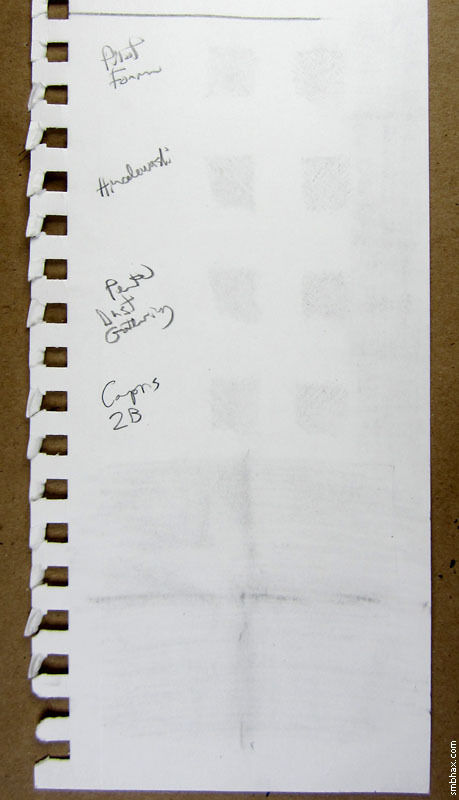 I tried gouging the pencil tip into the paper really hard, digging deep, graphite-filled troughs in the surface, and even scratching out solid square patches of pure lead covering. Let's see them handle THIS! I guess I'd like to see Uni's adult eraser--oh wait, more on that later--and come to think of it I'm not sure how this relatively hard, PVC-laden eraser is particularly good for the children: it shreds into tiny bits and makes a mess, and doesn't even clean up graphite as well as most of the other erasers. Maybe this is for the naughty kids. You finally figure out what the "Ain" name was for when you get to the "Stein" (get it? :P); Pentel Japan's web site touts the unusual strength of this PVC eraser, and it does feel firm, and I like the long form-factor, but it creates a mess much like the NanoDia, besides not erasing as effectively as the most of the others. All of the remaining erasers erase pretty effectively right from the first stroke, so "Light-Erasing" didn't really distinguish this PVC eraser (the Ain in the blue jacket in the photo) from any of the other contestants, and even pressing hard didn't quite get the lead out as well as four of the competitors. These pleasantly sherbet-colored erasers come in a nice big size, and their shavings roll together into easily-cleaned bunches pretty readily, but it wasn't quite cutting the mustard compared to a few of the others when it came to actual erasing. 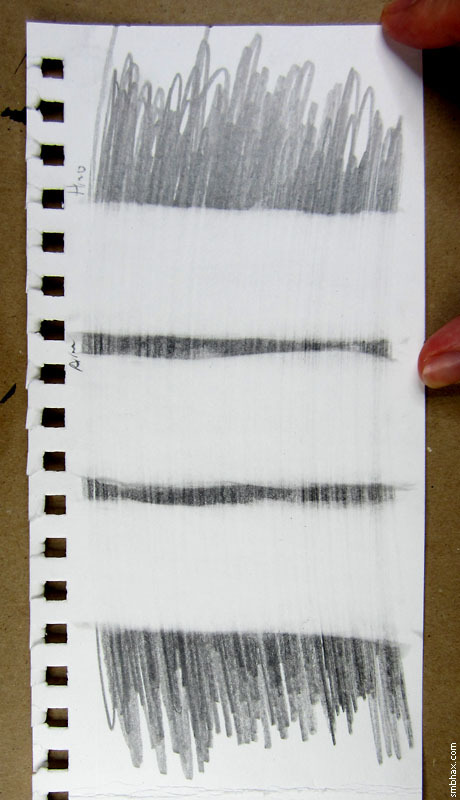 It gathered shavings together pretty well, came in a nice big size, and erased pretty well, too--it's just that three other erasers erased slightly better. Not a bad showing for the Foam, though. If you sort JetPens' eraser section by "Popularity," this long, square-tipped PVC eraser is #2; and #1 has a similar form factor, so maybe other eraser manufacturers should take note when it comes to deciding what shape to make their next erasers. It also just erases really darn well; the Matomaru-kun was by far the softest and tackiest on the paper, and just really seemed to grip the lead right off the surface. That's good, but on the other hand, it does require more effort to drag that soft, adhering eraser head across the paper; it's a long body but you have to grip it right up at the tip to get leverage, and even doing that, I had the tip start to split off, the only one of the bunch to have any kind of fracturing problem like that. So if I was going to go with a Matomaru-kun I might opt for the more traditional, thicker rectangular block-shaped version--maybe the one in the flashy gold sleeve. Even though I prefer to ditch the sleeve anyway rather than having to bother advancing the eraser through it all the time as it wears down--which brings up another possible drawback of this eraser: I'm not sure I would want that super-tacky, super-soft surface rubbing against my fingers all that much. Still, it erases like the dickens. This little PVC eraser--the Ain in the red sleeve in the initial photo--won't be gathering dust in my art supply pantry of shame--its supreme erasing power is going right to work on a daily basis! The name *is* a little funny, though; I guess they're just somewhat arbitrary, because the Ain "Light-Erase" model, for instance, probably "gathered" eraser fragments about as well as this thing, but this one erased at least as "lightly," which is to say, right from the first touch to the paper you really feel it going to town on the graphite. It has probably the second-tackiest surface after the Matomaru-kun, so it does take a bit more muscle to move it (maybe that's what the "light-erasing" of the other means by comparison, I suppose), but even the Small model--which really is small, like about the width of a penny--can scour a big piece of paper clear very quickly, it's just that good at erasing. It wasn't the best at "dust gathering" its own shavings out of all these erasers, but it does okay at that--certainly better than, say, the Staedtler, which doesn't do it at all. And it has a curious property of sometimes skipping right off thick graphite deposits, possibly leaving a long smear--but it can always clean these up. It does seem to be the most durable of the erasers, though; I'm not sure how, considering its relative softness and tackiness, but this little workhorse wears down really, really slowly, so even the Small is going to last me though a good many erased-many-times-over full pages--and rather to my surprise, I'm finding I prefer the nimbleness of the small size, so I'll stick with that rather than bumping up to the larger version. Clear victory to the Ain Dust-Gathering: the Boxy didn't clean as well, left small black shreds everywhere, and even created a couple weird black smears that it couldn't clean back off; if the Boxy had been around for my earlier rounds of testing it would have been eliminated at least three rounds back. It's a little long in the tooth now--some of those Boxy reviews go back to 2007--so maybe that explains both its large, devoted following, and definite lack of competitiveness against some of the young guns in the Japanese erasing world. 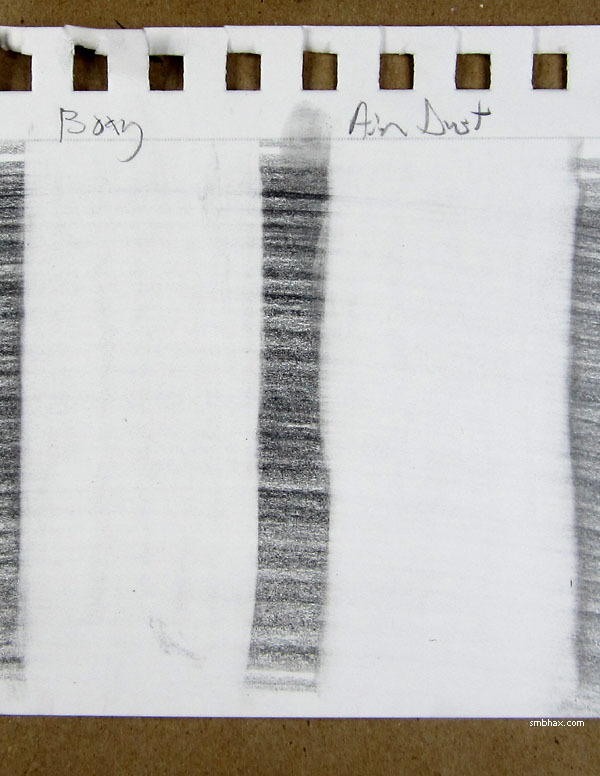 Well, that wraps it up for now: go go Ain Dust-Gathering! Speaking of older (I think?) erasers like the Boxy, though, I did manage to find a certain shop in Hong Kong that claimed to have some of Tombow's original, discontinued "Mono" erasers in stock, so if the one I ordered actually shows up at my doorstep (in the next couple weeks, maybe? ), I'll be able to pit that against the Ain Dust-Gathering, which will rule this roost at least until then. 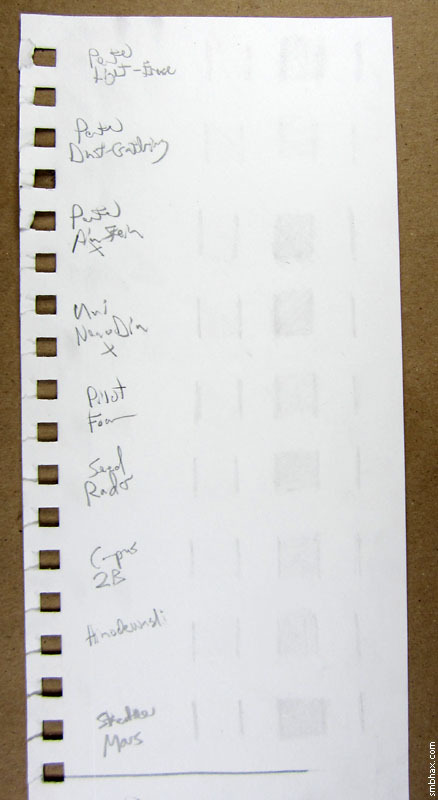 Update: For testing of the original Mono eraser, and testing on Bristol paper with softer lead--where I find a different eraser to be the best!--check out Supermassive Eraser Round-up, Round 2! Update 2: And once I got a Campus B/HB, that just had to be pitted against the Ain Dust-Gathering for the ultimate hard-lead championship! All that and more in round 3.